Bridge monitoring plays an important role in managing road and rail infrastructure, especially under extreme weather conditions. 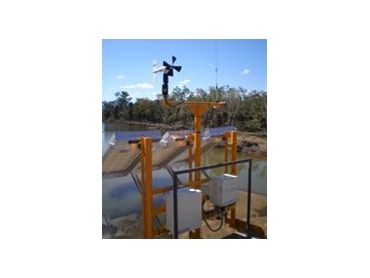 Campbell Scientific Aust have assisted in designing a wind monitoring system suitable for rail bridge monitoring. The site had sustained failure of a bridge pier during an extreme rainfall event in February of 2008. Due to temporary repairs made to the bridge, traffic across the bridge is not permitted under certain wind conditions. Campbell Scientific Aust designed a wind monitoring system that accurately gauged the current wind conditions at the site, communicating with an existing telemetry system networked to the locomotives and alerting drivers to unsafe conditions when necessary. Based on the site locations, the RM Young Wind monitor was selected as the wind sensor due to its propeller style configuration and practical maintenance requirements. In order to provide the interface between the sensor and the SCADA communications network, the Campbell Scientific Aust CR800 data logger, with its Modbus protocol support was installed. The CR800 data logger was configured to measure both wind direction and wind speed. Once the nominated wind speed threshold is exceeded, the data logger flags an alarm, which is passed on to alert operators in the vicinity. All traffic across the rail bridge is halted until conditions return to a safer level. Access to this information in advance allows the rail operators to minimise downtime and disruption to travel schedules. The CR800 data logger system distributes data to a centralised depot and onwards, through to the locomotive drivers, using the Modbus protocol over a radio network. The long range telemetry equipment at each of the sites adds a requirement for a significant power supply. Due to the remote location and lack of existing power infrastructure at the site, the only suitable option for powering the system was solar power. The high consumption of power led to the design of a solar panel system. Each monitoring site was equipped with 190W solar panels and batteries to provide a capacity of around 200A hours. The installation of the monitoring sites allows for accurate, real time and reliable measurements that can be distributed to the relevant parts of the rail network and lead to safer driving conditions. Alternative sampling techniques with handheld wind instruments by locomotive drivers were also proposed. Handheld measurements would have caused inefficiency and provided justification to installing a permanent site system. The new system allows the client to save on fuel costs of stopping and starting locomotives unnecessarily and allows them to maintain a better management of their travel schedules, without sacrificing critical safety aspects.